A report by ForestEthics, the nonprofit environmental organization whose mission is to protect endangered forests, has made a very startling revelation: that there are 100 million green reasons why junk mail are an annoying intrusion. 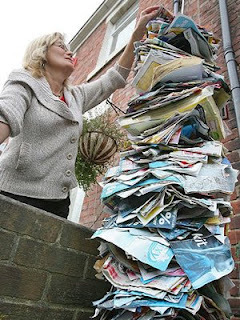 Not that the 100 billion pieces of junk mail Americans receive each year are irksome enough or that the emissions of junk mail are equal to those of over nine million cars or 51 million tons of greenhouse gases. The group estimates that every year, more than 100 million trees are cut down to make junk mail - the equivalent of clear-cutting all of Rocky Mountain National Park every 4 months! According to the report (PDF), those trees come from endangered forests like Canada’s Boreal, the forests of the Southeastern United States, Indonesia and northern Europe, as well as smaller areas of rare or disappearing forest ecosystems in the Western United States, Brazil, Chile, and Russia. The report which attempts to assess junk mail effects on global warming features a myth and fact section that debunks alleged misinformation spread in the wake of ForestEthics’ Do Not Mail campaign.